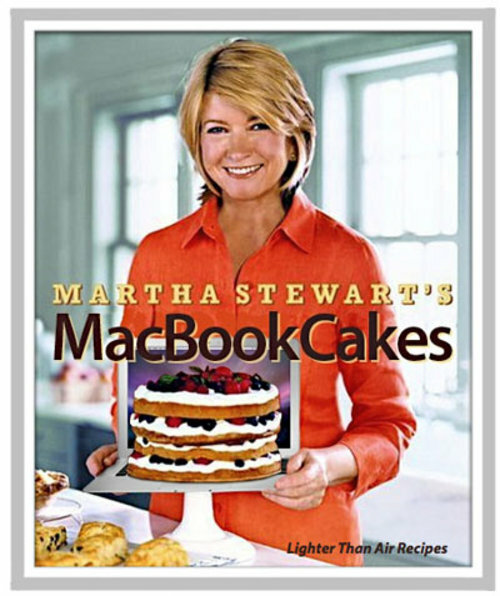 Martha Stewart's exuberant love for her MacBook Air has inspired a new recipe book created to promote baking cakes that are lighter than air. It's no surprise that a perfectionist like Miss Stewart was unable resist the cult-like appeal of Apple's amazing thinnovation. It's one subject guaranteed to to bring massive hits to any blog. "The MacBook Air is truly a technological thing of beauty. When it’s not traveling on the road with me, it looks great on my desk as you can see here." said Stewart gushing over her new toy. According to Amazon's review of MacBook Cakes, it's a recipe guide for people who hate to cook but love to bake lite and healthy treats for the Mac snacking soul. All pre-orders receive free super-saver shipping included. Featured cake photos from her book are available on her website to use as desktop wallpapers. It's not just another recipe book, it's Martha Stewart's perfect spring gift giving idea for any Mac head stuck in prison or out on parole. Happy baking! This is cool. 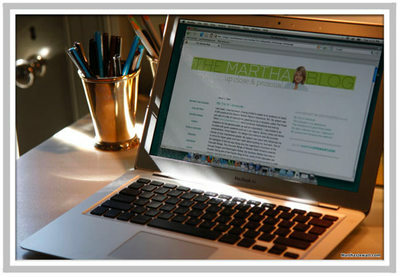 Martha Stewart using the advantage of technology. Awesome. I hope she comes up with geeky recipes for gamers who love to play in the kitchen as well.